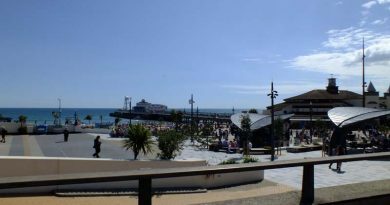 It has officially been declared ‘May Madness’ on Bournemouth Pier as spectacular half price offers have been introduced to help locals zip in to Spring! The offers are running from Tuesday 1st May to Friday 25th May. Single Zip wire flights will be available from as little as £10 and there will be 50% off RockReef upgrades, such as the Cave and the HighLine. In Key West Bar & Grill, at the end of the pier, all pizzas will be half price too! Local residents living within the BH, SP, SO, DT & PO postcode areas will be able to take up these a-may-zing offers by using the code ‘MAD18’ when booking on line, over the phone or in person. Upon arrival, visitors using the offer may be asked to produce a utility bill or driving license as proof of address. One proof of address is valid for up to 4 people. This offer excludes family tickets and group booking rates. Visit the web site to book and view full terms & conditions and session times. Show your RockReef or PierZip booking confirmation for FREE entry on to Bournemouth Pier, online bookings only. Summer Job Opportunities on the Coast with the Most! February 8, 2018 LGO Office Comments Off on Summer Job Opportunities on the Coast with the Most!